Nikon D800/ D800E left focus problem update: fixed successfully! Just got my D800E back from NPS. Apparently, the cause of the focusing problem in all cases is some inaccurate calibration data entered during the alignment/ calibration process. I was told it’s basically a case of hooking the camera up to the laser calibration jig, and letting a piece of software run a calibration routine point by point – there are no physical or mechanical adjustments made to the camera. The software then writes this somewhere in the camera’s ROM for future use. All testing is done with the 50/1.4, and the instrumentation is apparently sensitive enough to detect minor focus errors – they’re also present even on teles, but less obvious, is what I was told. Also asked about the new firmware that’s appearing in some cameras – apparently it’s legitimate, but not officially downloadable yet. No news on when that might be. My camera still has the same firmware it went in with – A 1.00, B 1.01, L 1.006. The good news is that all of the wides I tried the camera with now focus consistently between AF and live view, i.e. there’s no difference between the results from either AF system. I repeated the test a number of times, each time with the camera locked down on a Manfrotto Hydrostat head on top of a Gitzo 5-series systematic tripod, using flash. (Let’s just say that camera shake is a non-issue.) However, it’s also revealed that lenses are a lot less perfect and symmetrical than we would like them to be…the D800E has one seriously demanding sensor. This example set shot with the 28/1.8G at f1.8. The original size is visible here, which is a screen shot of 100% crops. Conclusion: problem solved. If you do have the left side AF issue, then send it in and insist they look at it – because there exists a fix, and it works. Barring any further AF oddities (it’s night time here and I haven’t had a chance to test AF tracking or 51-point 3D yet), I’m considering this issue solved. Thanks to the folks at Nikon Malaysia for turning around the camera so fast! I’m not sure it’s so much ‘not as stable’ as the higher resolution is showing us things we didn’t see on the D700. That might well be the case, but I wasn’t seeing even slight pixel smearing (which you’d expect, and see too if you downsized files from the higher resolution camera). I just got my d800 back from Nikon service and the focus is incredibly faster then before and the accuracy is now just insane like my camera was blind before now it can see hehe and the problem was like you said wrong software calibration for each af point and they put new numbers in through software nothing mchanical was touched and i got it in 2 days time which is really fast and now i can enjoy my d800 to the full extent and thanks for the advice Ming . My D800 has a serial number 80170xx and it is still affected by the left AF issue 😦 Tested it several times with my 35mm f/1.4G, very sharp in the center, sharp at the right hand but blurry on the left side. Dropped an email to Nikon Msia to see what can be done for my case, hoping to get it within 1 day since I’m not based in KL. Not good! Good luck getting it fixed. I’d call up first to make an appointment and explain your situation. Hy! Do you have any information if the autofocus problem have been resolved on the D800 and D4 for the new stock delevery ? No, sorry. However the more recent serial numbers I’ve used appear to be problem-free. This is a great thread, but why no more entries after July 25, 2012? It’s an old entry. Since then there have been nearly a hundred other articles, so it got buried and depricated. I am on my second d800 with the focus problem, it is going back on Monday. Nikon was unable to fix the first one. 5 months and still no working camera.FYI this time the right side is worst. Not good. Was the second one from a later batch? I cancelled my D800E order and I am waiting for Nikon to speak out on the matter. I was excited about the D800E but the focusing problem has strengthened my resolve to wait for a FF, high MP, mirror-less camera with image sensor focus. Maybe the new Sony FF NEX, the new Leica live view M10 or the new 2xFF mirror-less Hasselblad will beat Nikon to the market with the next generation FF high IQ camera. I don’t think they ever will officially admit a problem; that would be bad for business! Especially when there are so many potential variables invovled in the testing, most of which could be attributed to user idiocy. I wouldn’t put too much hope on the M10 having good high ISO performance; no doubt the images will be fantastic at low-ISO however. What’s this about a 2xFF mirrorless Hasselblad? 1. Sony is working on a Full Frame NEX with EVF and focus peeking. 2. The Leica M10 will be using a high ISO CMOS sensor and feature Live View. 3. Hasselblad will September 18 announce a 2xFF (36×48?) mirrorless camera with a high ISO CMOS sensor. The viewer speculations are EVF with focus peeking or maybe something new like a magnified LV with focus pan and peek. 1. Unlikely, that would mean new mount and new lenses – the current set doesn’t cover full frame. 2. And video too, apparently. And an EVF port. 3. Hmm…medium format mirrorless? Interesting. For same lens brands there are obviously adapters involved, and the degree of lens automation would vary with the legacy of the lens. 2. Leica M10 with video? I hope not. Take it easy Leica. One step at a time. 3. The 2xFF Hasselblad is supposed to be designed and labeled Hasselblad, sensor by Sony and electronics by Fuji. 2. I believe Andreas Kaufmann himself mentioned it a recent interview. Either that or it was Stefan Daniel. I’m sure we’ll get the usual slew of rebranded Panasonics, too. 3. That should be an interesting beast – except the ‘electronics by Fuji’ bit makes me think of the unusable UI beta experiments that are the X100 and XPro. I have 4 D800E bodies and after testing them side by side with the D3x I can confirm mirror slap is a problem on anything below 1/30 seconds at 200mm (70-200mmVRII – VR/off). Resolution differences aside the D3x was sharper by a long shot using the exact same focal length and settings, which tells me the D800’s mirror/sensor assembly is clearly not in the same league as the D3x. Tests performed with LensCal on a CF Gitzo tripod and Hydrostatic ball head using 10 second timer delay. Hope this helps a few people. Wow, didn’t even know “mirror slap” could be a function of internals of a camera until you posted this, thanks! This makes me wonder, are there other variables at play? Does mirror slap affect zoom and fixed lenses the same way? G vs D lenses? Weight of lenses? Basically, does mirror slap occur constantly at 1/30 across all lenses? If it doesn’t, do we have a minimum mirror slap shutter speed for different lenses at different focal lengths?! Nikon Service Center in KL rocks! I remember how they always fixed my gear promptly and in a courteous way back when I was living in KL. Thanks Ming for sharing this. For example, in “Camerapedia!” in July, it was stated, “Much better on D800E than D800; I would say for D800, it’s 85/1.8G > 85/1.4G; the other way around on the D800E.” But back on May 7th and its subsequent comments, the sentiment for the 1.4G was, “﻿It doesn’t focus accurately or quickly; in fact, it tends to hunt more than a little, and doesn’t snap to focus with the certainty of the D700…To top everything off, I find that if I calibrate the lens for close distances, then it’s off at infinity.” Ming, with your most recent recommendation to pair the 1.4G to D800E, are you saying these abnormalities do not exist with the E anymore after the focus issue is fixed or that they do exist but just less than the regular D800? I tried looking around the web for more answers and user experiences, which has been a confusing experience. B&H and Amazon user reviews are leaning more on the 1.4G citing its amazing bokeh; dpreview users are split; Ken Rockwell says 1.8G is sharper than 1.4G; and Mansurovs.com has a series of photos that show the superiority of 1.8G at various apertures. For years, I’ve believed that Nikon f/1.4 is the best possible lens due to its high price and specs, but perhaps with conflicting user reports, maybe it’s a sign that D800/E sensor design have outgrown the capabilities of a lens designed and released a few years ago for cameras like D3 and D700? Nikon 85mm 1.4G next generation lens coming out for D800/E soon? Sorry for the confusion. After more testing, I need to update the camerapedia – the 1.8G is definitely better. You do lose about 2/3 stop in transmission for a given aperture, though. I need to update the camerapedia. After further testing, the 1.8G is definitely the best option. But you lose about 2/3 stop in transmission for a given aperture agains the 1.4G though. Testing at the same given aperture for both lenses, for example 1.8, you are saying that you lose 2/3 stop in transmission with the 1.8G ?? That is not possible. It goes against the definition of aperture. I think you mean that ANY lens set at aperture 1.8 will be 2/3 stop darker than any lens set at aperture 1.4. No, it’s in the coating – the physical aperture is the same, but the transmission is not. The 85/1.8G has no fancy coatings; the 85/1.4G benefits from Nikon’s Nano Crystal tech on several elements. It definitely makes a difference to flare and contrast, which are related to transmission. Try it for yourself if you’ve got both lenses. Another extreme example is the Zeiss ZF 85/1.4 against the Nikon 85/1.4 D – there’s another huge difference there. In other words f-stop describes real and final luminance, no matter what glass or coatings are being used. We would have instant f-stop corruption and f-stop inflation if this was not the case. I agree on the definition of F stop – it’s real focal length/ effective physical opening size. But there’s also T stop, which measures the % transmission of a lens as a function of f stop; it’s a very common measure in cinematography (required for film grading) – and it’s also well known that two lenses of the same f stop might have very different T stops. I’m talking about T stops (T=transmission) here. I’m sure you can easily see how a lens with no coatings and high internal reflectivity/ light loss off its internal surfaces will transmit less light to to focal plane than one that has perfect coatings an no internal reflection or light loss. I’ve got an article on the subject here. Now you are talking. I wish you would have said 2/3 T stop instead of 2/3 F stop. My bad – communication mistake. My D800 could not get fixed. The service point told me that the current fix can not solve this problem completely and that Nikon is working on a better fix. That will probably take two or three weeks! Oh? Interesting (but unfortunate) – were you having the same asymmetric AF problems as the rest of us? Are they going to keep your camera While they are “Working on a FIx”??? Can you reuest a replacement or it it their choice? Thank you for your insights, and response. I imagine you are correct in your view that VR would compensate for both shutter slap and mirror slap. However, I tend to only believe my eyes, or the eyes of others. Is there any way you might consider doing a small test to confirm your hypothesis ? Thus far, to my surprise, nobody has done a test to see the affects of both mirror slap, as well as shutter slap. In addition, certainly one would wonder how LV mode would help, as well as VR. These different influences I image all will affect sharpness. Even our true Master Ming was working along the lines that the D800 was similar to the venerable d700 in terms of internal vibration. Now it’s clear that they are very different animals. Are you curious to find out what are the best and most practical applications of using LV and VR to mitigate eventual image softness? As always, I am very appreciative of your thoughts, suggestions, and time. A big thank you to Ming as well for providing such a wonderful forum. Thank you for your worthwhile suggestion. This will take some time since it will require equipping the camera(s) with accelerometers to avoid any guesswork. We already know that tripod, mirror lockup, LV contrast focus and remote release gets you a good bit on the way. I share your curiosity about quantifying this including additional gains possible through VR and electronic first curtain shutter. I’m thrilled to hear that you are interested in finding out how all these separate issues eventually affect image sharpness. I’m sure your efforts would gather broad interest from many people, after all, nobody has yet to examine these important , yet basic influences on picture sharpness. I do have one , if I may, suggestion, that the data could easily be generated and interpreted exclusively through visual analysis. A set up, stationary focus chart, camera firmly mounted on non resonance inducing tripod etc. Then, camera normal set up, LV set up, normal set up with LV, normal with VR, LV set up with VR, etc.. Do you think that a simple visual examination of sharpness would yield reliable valuable data??? With that said, I’m really curious as to what type of data you can capture with your set up employing accelerometers. Is your experience that this direction yields results that are consistent with, of different from a simple visual inspection for sharpness? Of course, I’d be really interested, ( and I imagine Ming would be as well ) to see the same set up with ” hand held ” parameters. My own personal interest is to see if this beautiful beast of a camera can somehow capture sharp images when being hand held at speeds slower than 1/125 of a second? I would be doing these test myself, but I passed on my early d800e. I’m waiting until Nikon starts producing d800e that are not plagued by focus issues. Thank you VERY much for your interest, and willingness to think about these important issues. I imagine you use this camera for mostly studio work, but your street photography is really exceptional, and I wonder if this camera couldn’t become a useful tool for you if better understood and explored? Are there reasons why you have chosen to keep in confined to mostly the studio environment? Size and weight, mostly, plus the previous AF issues. And the fact that I’m finding I need 1/60 or higher even with a 28mm to get critically sharp images. It excels in the studio environment, but there are much better tools for street/ travel work. I agree. I would be delighted if you would share your choices for street and travel. Just got my D800E back from Nikon PJ(Malaysia) this morning. It was stated on the receipt that they did PC adjustment and firmware upgrade for the body. The outer left and right AF points seem to be spot on upon simple observation and I haven’t even started fine tuning the lenses. Just a note to remind you about a workaround for perfect auto focus using the Nikon D800(E). When you shoot in live view the D800 does not use the tolerance sensitive secondary mirror and phase detect focus array. Instead it uses the image sensor and contrast focus to find perfect focus at any point in the image. The magnification available makes it easy to pinpoint where you want the focus. This shooting style is a bit slower than using the mirror/phase detect array and does not fit all occasions, but it produces perfect and uncompromised focus anywhere in the image when you really need it..
It’s the only way to use the PCE lenses with any accuracy, too. Ming, thank you for your fast investigation into the d800 mirror slap issue. So, your findings are that the camera is indeed not as stable as the d700. Good to know! So, when shooting hand held or on a tripod , the camera will yield sharper results when using live view mode at shutter speeds between 1/10 -1/60 ( aprox ) My next question to both of you is, ” will a vibration reduction lens affect or counter balance the vibration induced by the mirror slap” ? If at all possible, could one of you set up a simple comparison between using VR at a 1/30, and another shot with VR off. The camera of course should be on a very stable tripod when testing the affect of VR on the camera shake induced by the mirror slap. I think many people would be very interested to know if VR can counter mirror slap. Also, a big thank you to Bengt, your insight into better sharpness and focus when using live view, and a detailed explanation of why is very helpful! Thank you to both of you! The camera vibrations caused by mirror slap appears to be in the approximate frequency range of 30 Hz, depending on the camera. VR by Nikon and IS by Canon effectively suppress the consequences of camera movements in a frequency range from hand shake of a few Hz up to mechanical vibrations of about 200 Hz. Based on physics alone, vibration reduction should therefore be quite helpful in reducing loss of sharpness not only due to hand shake but also due to higher frequency vibrations caused by mirror slap and eventual first curtain shutter slap. Would that mean that even in tripod mode one should keep the VR on?? While framing on tripod I keep the VR/IS off since it otherwise can can cause minor image drift while fine tuning the framing. Before I cable trigger a shot on tripod I carefully turn VR/IS on again and double check focus and framing. Leaving the VR engaged a few seconds before shooting lets things ‘settle down’ a bit, which alleviates the framing drift issue somewhat. My D800 is with Nikon getting the left AF issue fixed. When I get it back I can do a test with my 105VR to see what I can figure out. It’s the only VR lens I have at the moment. I don’t think you’ll see too much of a left issue with that lens, but it should tell you a bit about the camera shake issue – longer lenses are much more susceptible to this. I actually saw this issue yesterday – not because I was looking for it, but because the shooting conditions happened to drop my exposure into the 1/30s zone to balance ambient and my LED panels. I couldn’t figure out what the issue was at first – the Manfrotto Hydrostat head on a Gitzo 5-series systematic carbon tripod is rock solid and rated to over 30kg – but I remembered your post, and tried switching to LV. This of course locks up the mirror, and produces a very low-vibration exposure using the shutter only – problem solved! So yes, you need to use MLU wherever possible for slow shutter speeds. However, I’m sure this is something MF digital photographers have known about for a long time – it’s just now we 35 FX photogs are discovering it with the increased resolution of the D800. Thank you as always for your reply. Now that you have experienced ” the problem ” in the d800, would it be possible to clearly identity at what shutter speeds the d800 is soft due to mirror slap vibration? You, of all people should have the technical skills to examine when you need to employ LV mode when shooting on a tripod. 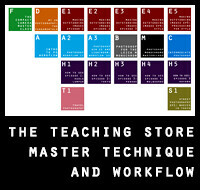 Wouldn’t this information be helpful for you in the studio while shooting? Also, now that you have identified for yourself the mirror slap issue, are you curious if the added weight and mass of a battery pack works to offset this ” problem” ? I’m sure many people would find your investigation, and the ensuing results very helpful. I don’t think the battery pack would help as it introduces another element and set of connections into the equation – the attachment point between pack and camera is not that rigid, and if anything would degrade overall rigidity of the system. Good news. I tested my body today, confirmed it DOES have the issue. Guess I need to send it in to get fixed. I hope Nikon can turn it around quickly. Ming, how long did it take to get your camera back from NPS? I just received my NPS Membership today so am hopeful that mine will be repaired & returned soon! I am only relaying what I was given by Nikon – and I do know that I have a different lens database firmware than when it went in. Ming’s blog is not the official correspondence avenue for Nikon, and Ming’s singular incident does not speak for all other AutoFocus issues and solutions. 1) The AutoFocus problem is widepsread. 2) The AutoFocus problem affects each camera to a various degree, hence Nikon’s AF Defect categorization process (for example, some problematic cameras are categorized as “B2”, and fixed in a certain way specific to the B2 categorization). 3) Nikon is able to get away with using software-only modifications to fix the issue; in many other cases, both hardware and software adjustments are required. 4) Some people have had their cameras fixed on their first-go with Nikon Support; however, many others have to send their cameras back a second and third time, sometimes finally getting fixed, and sometimes never getting resolved. 5) Whatever internal information Nikon has about this problem isn’t systematically being shared, or practiced, by all global Nikon support centers, because many of them are not successfully fixing the problem. 6) There is no 100% successful universal fix to this problem at this time. So, while I’m happy for Ming, Ming’s case does not represent all other AF cases, nor does it signify any sort of AutoFocus Fix Confirmation. I really wish people would stop posting this rubbish as some sort of universal fix. It’s just simply not true. It’s definitely not a universal fix. It is a calibration/ adjustment that requires somebody at Nikon service to perform, and the effectiveness of the repair depends very much on the skill of the technician performing the calibration. However, at least there is a way to address the problem now as opposed to ‘sorry, we don’t have a fix yet’. Great to know there is a fix. I’ll be testing my camera today to see if it has the issue and getting it fixed asap if it does. Thank you for your very thoughtful work, and writing. I see indications from across the web that the d800/e cameras suffer from mirror slap vibration. Have you, could you, test to see at what shutter speeds the vibration softens the image? Certainly employing your arsenal of solid tripods would be a good start. I am very curious to see how shutter slap affects the image capture as well. As I see it, mirror slap, shutter movement, and additionally the employment of the battery pack to further stabilize the camera ( larger mass ) all would have some eventual impact on image capture/sharpness. Nobody on the web has done a serious look into how these three strategies work together or independently. Is there any chance, or interest on your part to see how these three variables affect sharpness. I understand you are very busy, so no worries if this is not high on your list of things to test, etc. Thanks Adam. Once things are locked down on the tripod, they don’t move – so I think you’d only see it with either a slightly unlocked head, or handheld. I don’t have particularly steady hands, but I do notice I need more shutter speed than expected to guarantee critical sharpness; perhaps 1/60 or so for the 28mm. I didn’t notice any more vibration than with the D700, though. typically don’t generate softness in the capture. Could it be that your use of flash within your studio set-up, has lead you to believe these issues don’t exist? My guess is that if you repeat the test as seen in the link provided, you too will be able to verify shutter and mirror slap issues. I shoot with a d700, and treasure it’s ability to capture sharp images at slower shutter speeds. Especially when mounted to a good tripod. Is there any way, or interest on your part, to set up a minimal test, and see if the camera exhibits softness due to mirror slap when mounted on a tripod? 1/4 of a second through 1/00 of a second? I just got my D800E back from Nikon USA, after thinking they finally got a fix. I tested the camera against the 85mm f/1.4G and the 24mm f/1.4G. For the 85mm, everything is tact sharp. With the 24mm, the center is tact sharp, but both left most and right most AF points are soft on the PDAF, while tact sharp on LV. Is this the nature of the lens? Or did Nikon not really fix the problem? Hmm, tough question. It could be field curvature (unlikely though, it should still focus fine in the VF but the rest of the frame would be soft, and this effect would be symmetric left-right). If everything is sharp across the same plane when LV focusing, I’m inclined to say it’s more likely that they didn’t really fix the problem. Have you tried to see if AF fine tune helps at all? Hi Mein, yeah i did use AF fine tune (-8). But like you said, if LV can be tact sharp across the board, it’s not the lens. When you say that the PDAF is off I assume you are judging it through the viewfinder. The viewfinder is never a true indication of focus. Live view focus and viewfinder focus are two separate things. The important one is the live view focus. That’s the one that becomes your digital image. If your live view focus is perfect be happy. You viewfinder focus requires additional accuracies, over and beyond live view focus. The viewfinder focus only counts if you do manual focusing through the viewfinder, which you should never do since they can be slightly different. Just had my D800 back from Nikon UK after about a fortnight. It has exactly the same lefthand focus problem as it did before I sent it to them. I have contacted them again and await their reply. Two weeks to do nothing, well done Nikon UK. Apparently it’s been the same case in some other parts of the world too. Their internal communication needs help. Had a reply from NIkon UK. Need to send it back again (obviously), however it will be fast tracked this time (?) so hopefully will not have to wait another 10-14 days. Also it will be looked at by a “senior technician”, so last time it must have been the tea-lady. Not that I have anything but the utmost respect for tea-ladies, they do a sterling job and without their endeavors the UK would be nosediving even faster than it already is. That’s ridiculous. If I were you, I’d seriously consider writing a nasty letter to somebody senior. That’s just not on – firstly they get it wrong, secondly they get it wrong and take their time to fix it? Sorry to hear that, Peter. One of the problems is that the issue is not as noticeable if a 50mm f1.4 is used, but on my 14-24 it shows up VERY clearly. So I am enclosing a step by step guide and a set of .NEF files with the camera this time so they can see what each focus point is doing (activate “Focus Point” in View NX). It’s not my lens as that has been perfect on my other cameras. Agreed – but I was told that was the procedure they were given, and their setup is sensitive enough to detect and adjust for the error even if a 50mm is used…just relaying the information I have. The fix apparently requires new parts as well as tedious adjustments. If the demand for the key parts compete with production, and the new parts sometimes suffer the same problem, the fix becomes hit and miss. 1. Nikon can not continue to put out bad product. 2. Nikon should test and screen all D800 for focus problems before shipment. The test only takes a couple of minutes. The fix is a different story. 3. Nikon can not continue to fail to repair product sent in for focus issues. All returned D800 should be tested, and if not successfully repairable the product should be replaced with a tested and passed unit. Nikons present strategy is beginning to show the marks of a miss-managed company. I don’t know about new parts – I was told nothing got changed, but I really have no way of telling for sure. I have heard rumblings that the same problem can sometimes be seen in other high end Nikon camera bodies. In other words, it might be a systemic problem with a larger Pandora’s box. If Nikon has told their service centers: “We have a problem, fix it”, you would get a consistent response from all service centers. However, if Nikon has told their service centers: “We don’t see a problem”, you would get the present inconsistent and unsatisfactory response from the service centers. It’s definitely there on some of the other bodies. The loan D4 I was given while my D800E was in also displayed the same issues. I don’t know if the D3/ D700 bodies didn’t have it, or if the resolution wasn’t high enough to see the issue; my D700 doesn’t seem to have the same problem. I think Nikon should offer firmware with additional and individual focus fine tuning points for all the cameras selectable focus points as well as for additional points along the focal lengths of their zoom lenses. Agreed. Most people would never know, never need and never use it. But it would save Nikon a lot of money in production and service and it would make a few users very happy. FWIW, the status on my camera has been moved to “In Shop”, as opposed to “Parts Hold”, so at least in Melville, NY, USA, they’re able to accommodate new left-focus repairs. From all the various posts across the web, it seems fair to say that their customer service arm is mismanaged. There is definitely a lack of communication between various divisions. Aside from those based on geography, my experience exposed no acknowledgement of work done via the online service (examination of images, detailed descriptions etc. etc.) and their physical service center (Melville). I explained the back and forth I had to date and the guy acted like I was talking gibberish – to the point where he actually said “I don’t really understand what you are talking about”. Just incredible. I offered him printouts of my case and then he said “oh… then you’re talking about technical support. We don’t need that.” I suppose that’s fine, but IMHO, he took entirely the wrong approach and left me, the customer, with a lack of trust and confidence. It might also be worth noting that it became clear that the online support is outsourced to Stream Global Services which might also help explain the disconnect, both operationally and mentally. So yes, at this point I’m clinging to blind hope that the handful of successful fixes will somehow be replicated with my repair despite growing evidence of Nikon’s incompetence. Thanks… I appreciate the sentiment. At the end of the day, I’ll be happy for both of us if our cameras come back razor sharp. But I feel for PeterJ for the UK who went through the whole ordeal only to end up right back where he started. I would almost say that there is more a bias towards bad service stories than good ones because on balance, people will be moved to chirp when their experience is below par. I have seen a smattering of success stories so that alone gives me hope, but all companies need to pay better attention to major forums and blog comments as they are canaries in the mind shaft on customer sentiment. I can only hope Nikon HQ is reading this; I know Malaysia does, which might at least partially account for the service I received. Ming, great site, and good job on reporting this. However, regarding the argument about not having enough resolution before… Total bunk. Think about it, the AF sensors on the D800 cover about 95% of the DX frame. The AF sensors on the D300 cover about the same area of the frame (also DX). Better yet, the AF sensors are positioned at exactly the same spots on FX lenses on either camera. Both are 51 point AF systems with the same point pattern (I know, I own both). In the DX frame area the resolution of the D800 is ~3200 lines and the D300 is ~2800 lines. There is only about a 10% difference in vertical resolution under each AF sensor when zoomed to 100%. If there were AF errors on the D300, we would have seen them. I checked mine closely – none exist. The camera is 4 years old and still focuses perfectly having never needed any service. 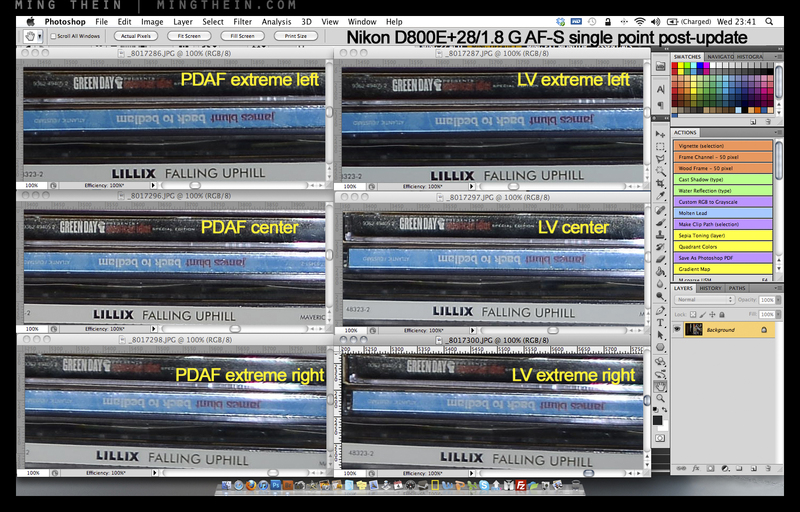 I believe that the Nikon D800 focusing problems are indicative of a shift in camera manufacturing technologies. Both Canon and Nikon are trying to reduce cost by loosening manufacturing tolerances on both bodies and lenses. Instead they are introducing adjustments such as lens correction factors. This works fine for primes but only partially for zooms. One of my high end zooms while corrected at the long end is still unacceptably soft at the wide end. If the D800 focusing problem continuous I wouldn’t be surprised to see firmware to correct all the cameras individual focus points. In other words separate correction factors for center focus, left focus etc. One thing is clear. Something has to happen. The combination of tolerances and technologies used in the D800 does not appear to yield a reliably reproducible camera. It’s a shame, because the Sony produced D800 image sensor represents a big leap forward. Now the rest of the Nikon D800 has to catch up. my D800 has firmware A1.00 B1.01 L1.004 i notice this is different to your camera but find no update here in UK ? Can you confirm that Nikon Malaysia are using a laser based AF calibration jig? If so it appears Nikon Malaysia are using more advanced calibration technology than Nikon in Europe. No idea, I’m speculating because it seems like the easiest way to do it in a consistent and automated process. They wouldn’t specify the details. It could be entirely manual too. Is there a D800E serial number past which Nikon guarantees that the focus calibration is correct ? I will place an order (again) once we pass this point. That is not the answer I was hoping for. However, I think that Vincent has a better response below. At this point, we are all speculating. I can only advise that you test the camera you are going to buy before you buy it. Thank You, that is my own conclusion as well. You would think, however, that after a certain date or serial number Nikon would include these tests in their own quality control. This statement, if true, strongly implies that Nikon has found the root cause of the issue. If this is true then you would expect Nikon to have corrected the issue by the next batch. Due to strong demand Nikon is running with a very lean supply chain for the D800. There isn’t a whole bunch of inventory sitting around. If we continue to see faulty D800’s after about a month then I would be start to doubt that the root cause has been identified. I had the same problem with D4+14-24. My Nikon Point in Europe denied that there exists any AF problem with the left field using a D4/D800. They “fixed” the problem with the D4 and the 14-24, but since that day all other lenses are working well with the left field, but are useless with all the other AF Fields. I hope it will work out with their second attempt. Sounds like they just shifted the AF offset to fix the left problem without trying the other areas. Sorry to hear that. I will keep you updated how the camera and the lenses behave after the second fix. And how they focus on another body or other lenses I haven´t sent in focus with the D4. At least your result and a few others are showing that there exists a fix. I drop my d800 june 22nd at long island nikon center. today is july 6th. i still wait 4 my camera. they know left focus problem. my camera is still in the shop 4 repair. i wish 2 know nikon USA know the left focus solution. also i ask nikon 2 recalibrate screen. nikon ask me 2 pay $30 4 calibration. but all asian sevice center do it 4 free. i wonder why U.S.A. service center take more than 2 week 2 do auto forcus fix and want 2 money 4 calibration. i start worry about my camera. No idea. I’m not Nikon, so I suggest if you’re not happy you file a complaint with them, or ask them to contact one of the Asian centers if they don’t know what to do with the problem. For what it’s worth, I plan on bringing in my D800 to the Melville, NY USA center tomorrow. Nikon has analyzed some test images and concluded there is an issue. Your posting make me nervous about timing, but hopefully we both will have better luck going forward. Check with them first whether they can do it on the same day, if not, get them to send it back to you. Because of timing of future work, this window of time (even if it’s 2 weeks) is my best shot at being the least inconvenienced. I brought it into Melville this morning with my fingers and toes crossed. In chatting up the person processing the drop-offs, I found that there were a number of technicians out of the office around the July 4 holiday here in the US; that could be part of the delay. In any event, I’ll update on results if there is interest. Please do – and hope it goes well. I’m not sure it is a laser fix anymore – I haven’t been able to get any more information. Hope whatever it is they’re doing works, though. Sounds like good news Ming, thanks for the update. Looks like Nikon Malaysia has 3 “service” locations: did you bring it to the store at Berjaya Times Square? Or to the Petaling Jaya location? (Or Pulau Pinang?) And any sense if they are swamped with these D800 tune ups or not? HQ at Petaling Jaya. All of the big repairs will land up back there anyway. I didn’t think they were swamped – they said they’d had a few back but not droves. All first batch cameras. Sorry, no idea on serial numbers – there were definitely early batch cameras that were okay, too – I’d suggest just trying it out for yourself. However, if you get the A1.01 and B1.02 firmware, you should be fairly safe. How do they know the 50 1.4 is correctly focusing? If the calibration lens is out will it not affect the ther lenses we use. My 50 1.4 has appalling focus shift. No idea – I would have thought it’s a specially calibrated one, or at least a reference lens with known properties. However, the fact that my D800E now requires +10 on all lenses as a starting point seems to suggest otherwise. how long does it take to fixed the issue??? I sent in my D800E on Monday 2Jul to Nikon Singapore and got it back on Thursday 5 Jul – 3 days. Suppose to af fine tune on some of my lenses today so that I can do some test shots but was held up due to some other last minute commitments that cropped up. Will comment once I have the opportunity to test some time next week. Considering I am not a NPS member, I think the turnaround for my camera is fast. I was told to wait for 2 weeks when I send in. How is yours performing now? MT, manage to do af fine tune on 24/1.4G yesterday evening. Did a tripod mounted test for left, centre & right using PDAF vs Live View, the all look the same and consistent now. Tack sharp too! Good result – I am a happy person now 🙂 Af fine tuned rest of the prime lenses this morning. Interesting to note that the lenses don’t back focus only but mixed with low adjustment. 24/1.4G (before -15, after +5), 50/1.4G (before -13, after +6), 85/1.4G (before -10, after -1) and 135/2.0D (before -7, after +2). Haven’t gone thru’ the zooms yet but I guess it will a mixed bag instead of just back focusing. Overall, I guess the issue is fixed. MT, thank you for being meticulous in discovering and highlighting the issue. No problem, and good to hear. I was told that they haven’t seen any problems with the new (last) batch they received. Or people didn’t notice it, because it’s only noticeable with fast wide lenses and the edge AF points. Not a typical combination of parameters for your average shooter. Sounds similar to what I heard, except for the 3 zones bit vs 51 points. My tech’s English wasn’t the best, and some things just don’t translate well, so you might be right. All ‘n’ all satisfied with the current performance of my D800, although it is not completely fault-free. I still get the feeling it’s not quite as positive and solid as the D700/D3 was; perhaps I’ll try a later production body and see if that improves things. It has been suggested that the extreme left and right focus points on the D800/D4 are no longer direct sensor readings but software extrapolated readings of less extreme left and right focus points. If that is actually the case, it would be Ok as long as Nikon gives us (and local service centers) access to fine tune those variables separately. That’s interesting – and possible, though if you look at the shape of the underlying AF sensor pattern, there is a notch shape corresponding to the AF grid…so perhaps they are still real points. Hi Ming, yesterday I got some additional info. The software to align the AF fields consists of 3 stages: (1) it checks for dust on the AF sensor, (2) it determines the offset per AF-field and stores this in the memory, (3) it re-checks the new values by doing a measurements again. I’ve learned that the software only checks the AF module. During this test NO photos are being taken, so only the AF sensor is checked for asymmetric behavior, and no check is done with its relative behavior towards the sensor. This explains why next to this software step, AF-fine tuning may still be required after the repair (unless this is compensated by the repair as well)! Seems odd that it should actually take several hours to perform, though. What I heard was that there was some technician intervention required along the way, and a reference lens was used – perhaps there’s more than one method floating around out there. Good to hear that your AF issue is resolved. I heard that Nikon Singapore Service Center are accepting D800/E with the AF issue. Previously, they do not accept as they are waiting for instructions from Japan. I’d imagine it’s probably the same fix I had done. Seems a little odd for them to refuse to take cameras that might clearly have a problem, though. I think I have another type of issue with AF. I tested my D800 with 50mm f/1.8G, centre focus point is all clear from left to right across the test chart, but when focus on extreme left and extreme right focus point, the centre of the test chart appeared blur instead. Has anybody encountered similar issue? Sounds like field curvature of the lens. Are the edges sharp at the focused point? Yes, the left/right focused points are sharp and at first I suspected the same like you said. But this issue only happened when using view finder, it appeared sharp from left to centre to right when using Live View under same set up. That’s completely inexplicable. Unless there’s a slight difference which requires AF fine tune to correct, and the edge point is within tolerance but the center isn’t – i.e. a slightly curved focal plane, and equally slight amount of AF shift that’s masked by depth of field? Unlikely with the 50/1.8 though. I will run more thorough test with different AF fine tune settings and see how it turns out. Anyway, do you think if I can conclude that my camera doesn’t have the left focus issue you guys are having? Doesn’t sound like it, but without trying it out myself I can’t guarantee it. I rerun the test with (-5, -10, -15, -20) and without AF Fine Tune for each of centre, extreme left and extreme right focus points. Below are the image links. All the info are intact and if you view with View NX2, you can turn on the focus point. Based on these images, are you able to tell if it is something wrong with the body or the lens or both? Thanks a lot. p/s: pls let me know if you are not able to download the images. Not really. I don’t know exactly what you did, so I can’t say whether discrepancies are due to the AF system or the test methodology. Try following these instructions – the results should be self explanatory. It does not mean that there is something wrong with the lens. It’s the live view focus accuracy that counts. The viewfinder ground glass location, the accuracy of the pentaprism and the additional lenses in the view finder creates a more complicated and secondary focusing problem. Trust your live view focus, It’s the one that counts except during live view manual focusing. I figured there is problem with the viewfinder focusing system, just that I don’t understand how the AF system works. In what scenario would central focusing out of focus when both left and right edge is in focus? By the way, I just noticed that Flickr actually limits the size of uploaded image to 2048×499. To download the full size image, please go to https://picasaweb.google.com/iiithebest86/Cropped?authuser=0&authkey=Gv1sRgCL2spdnxr8Td6wE&feat=directlink instead. Sorry, probably I didn’t make it clear. Here is another set of images: http://www.flickr.com/photos/iiithebest/. When focus on extreme left and right, the center portion of the image is soft like I mentioned in my previous post. If the focused points are sharp, then it may be field curvature, or the target not being perfectly parallel to the sensor plane. The focus problem is ONLY when there’s an inconsistent difference between LV and AF across the frame from left to right. Since you are showing us actual photographs, shot with AF, the view finder does not enter into the picture. I see decent but imperfect focus across the entire image in your center focus shot. I see sharp focus at the two ends and softness in the center in your left and right focus shots. This suggests the following: The lens has a slight object plane curvature AND your focus fine tuning is slightly off. If you optimize your focus fine tuning I think you will see left and right images go slightly soft when you center focus. You can not do accurate fine tuning with the setup that you are showing. You need to get a digital interference chart displayed on your PC to fine tune with. Thanks for taking time to go through the images. I have gone through fine tuning but under the same setup. But with -15 fine tuning, do you think it is unacceptable and I have got a bad lens? By the way, the digital interference chart fine tune on pc that you mentioned, is there a link on how to do it exactly? You probably want to set your focus fine tuning for the focus point that you use the most. It is easy to change if you map and memorize the alternatives. I now understand that this is the characteristic of the lens and I think I know what to do next. Thank you for your valuable input and I appreciate it. Hi, I just sent my D800 to Nikon Malaysia for the same issue today. Hope they can fix it soon. Got back my camera the next day. Very fast service. Same calibration done. Still have no time to test but it should be fine, I guess. Thanks so much for your help with this! I’m curious if the 24G’s performance is improved with the D800E recalibration; could you please let us know if you get a chance? Very much appreciated; your site is the first I know of with proof of a definitive fix for this issue. No problem. My 24 is acutely astigmatic, so I’ll have to get hold of another copy to try this. I would test the lens at longer subject distances also. I can’t see any problem on my 28/1.8 until I focus on something further away. I’m still suspicious of any software-only fix. I sent my D800 in to Nikon service for repair, and it was returned – “no problem found”. Yet I still have this issue. Yes, I have done so – everything still looking great here. The lenses aren’t perfect, but there is consistency between PDAF and LV. I just called Nikon Malaysia today. The technician told me to send in my camera for checking as based on the test result i done before (i described verbally through the phone), he said that my camera seen to have back focusing issue. I will bring it when i will go back next time, anyway glad to hear that your camera was fixed. Look for Decward in Service. Looks good, although as you say, it is revealing a lens that is somewhat decentered. I can’t believe that in the factory that they would calibrate all 51 points as you have just had. So even if the issue was “fixed” in manufacturing, it will probably never be as good as this solution. What I don’t understand, is that people are STILL receiving cameras with the issue, when clearly Nikon have a post-production fix. Why can’t they at least get it “better” in production?! There will always be some older stock still going through the distribution chain, so it’s possible that the new, fixed units are only entering sale now. And yes, sadly, my lens has slight decentering issues. It’s not too bad so I’ll live with it for now. The new D4 firmware, version a 1.02 / B 1.02 has been available for download from the Nikon (Europe) site since this morning (4th July). Can you test this for us on clearer targets? Personally, from looking at your larger test image, if these were my results from the fix, I’d be sending it back in. 1) All of the LV focus points seem a touch softer than the PDAF counterparts. 2) Both the right PDAF & LV focus points are substantially softer than the center PDAF & LV points, and the left PDAF & LV focus points are slightly softer than the center PDAF & LV focus point. It’s clear enough to me. I repeated the test on a lot of targets but just posted one for illustration (pointless to do otherwise). LV and PDAF are never going to be perfect, but this is more than close enough for my needs (and matches the D700) and is much, much better than when it went in. Nobody shoots test charts in real life. Cool! Thanks for the update. Enjoy. Just wishing yet not shipped units have this pre-resolved! The latest units have a different firmware. I imagine this might solve the issue, but hard to tell for sure without using a few. I was told that the problem is confined to the first batch only. I talked to some folks at BorrowLenses.com and they confirm the the first batch had issues for sure. They have a bunch of D800s that they need to send for fixing. Would you know, when the second batch start shipping? I don’t own it, so it’ll have to wait if I happen to have access to a lens. Did you have to send your lenses in for body-lens calibration also or was it done only to the body? That’s great news! Thanks for the update and in-depth analysis on this issue. Will be sure to bring mine in as well, as soon as I do a few more tests with my other lenses. Let’s just hope the Nikon here knows about this fix too. I bought my D800 in June and my reason for choosing a Nikon as opposed to my usual brand of Canon was because I have had so many bad experiences with the later repair centre here in UK. I was reassured and convinced that noone was better than Nikon for after care. I am more than saddened to read their behavior is slipping into the realms of ‘poor’ and I am beginning to think its more about attitudes than company policies. Lets hope they improve their customer service and their attitudes as soon as possible before irreversable brand damage is caused here in the UK. I would try not to jump to conclusions until you’ve had to experience it for yourself; I’m sure that there have been plenty of good service stories for every bad one. AF-S or AF-C? AF-S is solid, AF-C hunts. It does it with my D700 too. You mean your D700 exhibits the same behaviour on D800E? Mine does not shoot when AF-ON is pressed and not in focus in AF-C(when set to focus priority). It will shoot when you chose to activate AF with AF-ON button only and never actually press on the AF-ON button. Ok, Custom setting in D800E, a1: AF-C Focus Priority, a4: AF-On Only. Tested with lens cap on. This does not happen on the D3s. This happens on the D800/E. The manual states for **Focus Priority** : “Photos can only be taken when the in-focus indicator (o) is displayed.” which means can only shoot if in-focus. Are you holding down the AF-ON button when you shoot? If you press it once, then press the shutter, mine shoots. I think the camera may be thinking the user has already decided the image is in focus, so it’s just following the leader. Both D800E & D3s settings same (as stated above). Yeah, I guess it really depends how you look at it and better to know the camera’s behaviour. Come to think of it, don’t think it’s major nor will it affect shooting in a big way 🙂 If based on manual’s description, then point 2 on the D800/E is not what was describe from a “focus” point-of-view. I guessed because without holding the AF-ON button the AF is not activated, that might explain why you can shoot even if it isn’t in focus. I actually think it is better this way. As you might missed some important moments when the lens just couldn’t caught focus, with the current ”bug” I think you can at least quickly manual focus it to shoot. I actually think this is an improvement, it’s great for journalist and event shooting. It means the difference between no shot and a shot (maybe okay due to DOF) – so yes, I see it as an improvement.